My next feature couldn't be cuter. 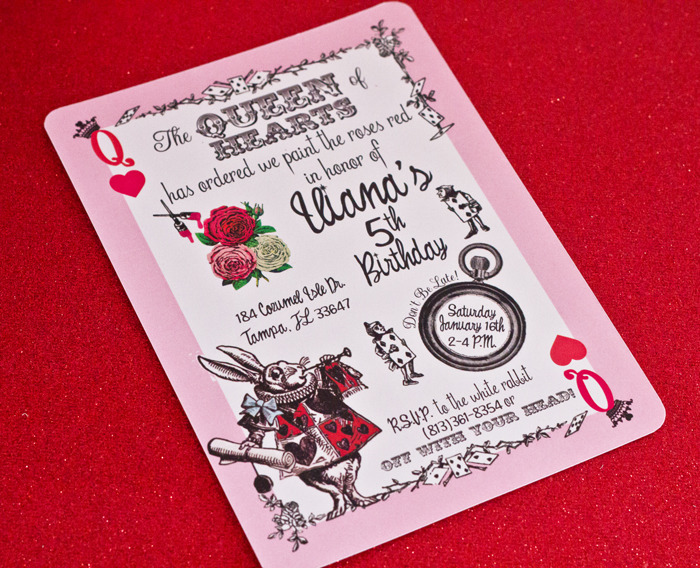 This QUEEN OF HEARTS BIRTHDAY PARTY submitted by Danielle Arcese of Cutie Putti Paperie is just too fun. 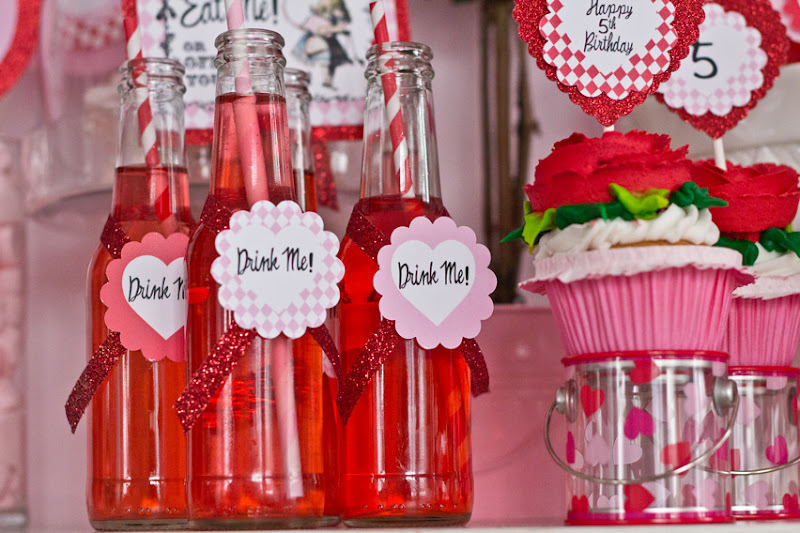 A perfect theme for a Valentine's Day party as well! 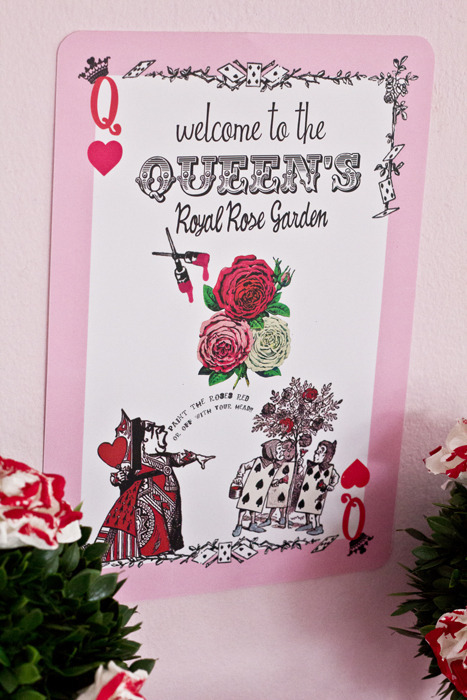 Here is what Danielle said about her party-- "Down the rabbit hole we go.... off to the Queen's royal rose garden in celebration of a very merry unbirthday! 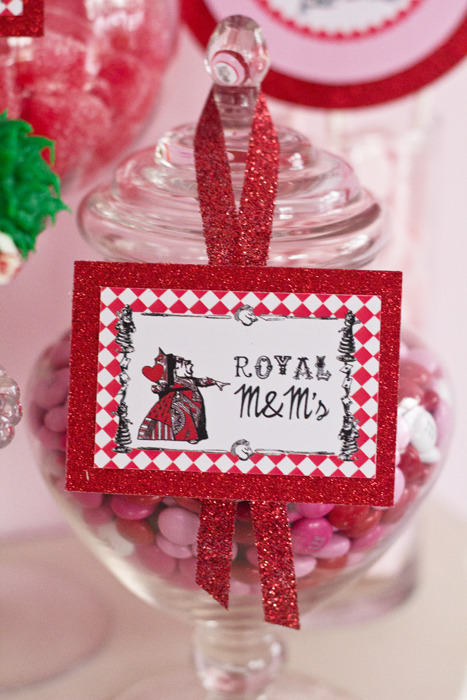 This theme is a great alternative to an Alice in Wonderland theme. 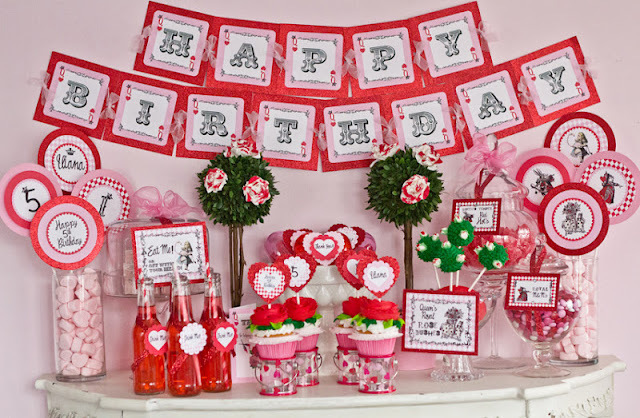 With vibrant reds and soft pink accents, this collection works great for birthdays all year round, and is especially fun for February birthdays or Valentines day parties. You can Invite your guests to paint the roses red in honor of your little ones birthday, or of course, OFF WITH THEIR HEAD! I created this dessert buffet with items that I found at my local Michael's craft store. I purchased the mini round topiary trees there, along with the white paper flowers, that I painted the edges with red craft paint. I then hot glued them to the topiary trees. I also purchased the adorable mini paint cans that the cupcakes are sitting on at Michael's as well. 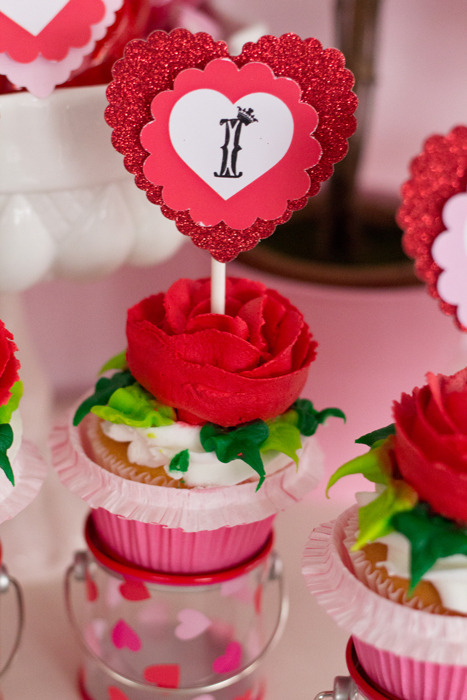 How perfect are they for this theme :-) The cupcakes I purchased from a local bakery. 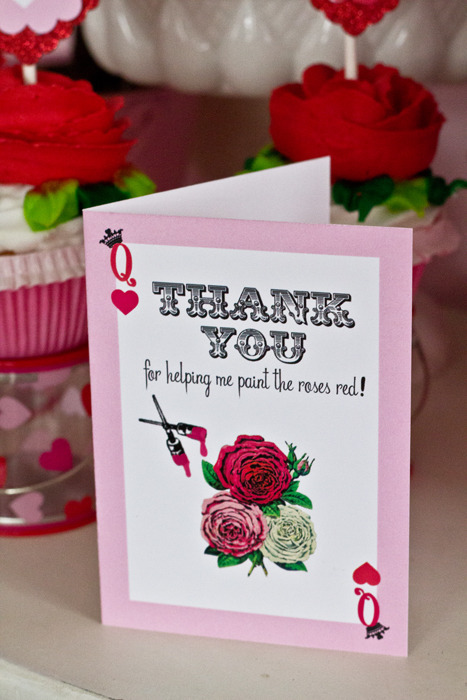 How divine and luscious are the huge red buttercream flowers that cover the whole top? 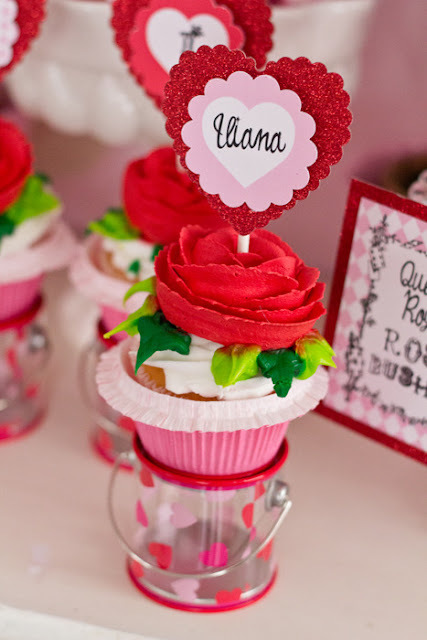 I topped them with my custom designed cupcake toppers punched with a 2inch round scallop punch and then backed on red sparkle paper, punched out in the shape of a scalloped heart. 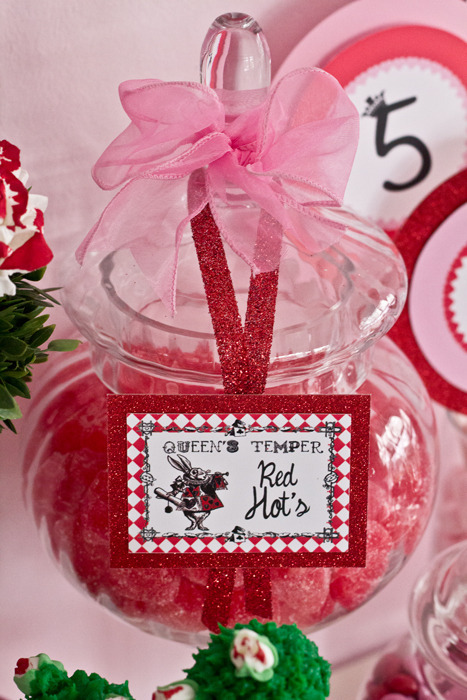 Candy for the table included the "Queens Temper" red hot cinnamon heart gummy candies, and Royal M&Ms. 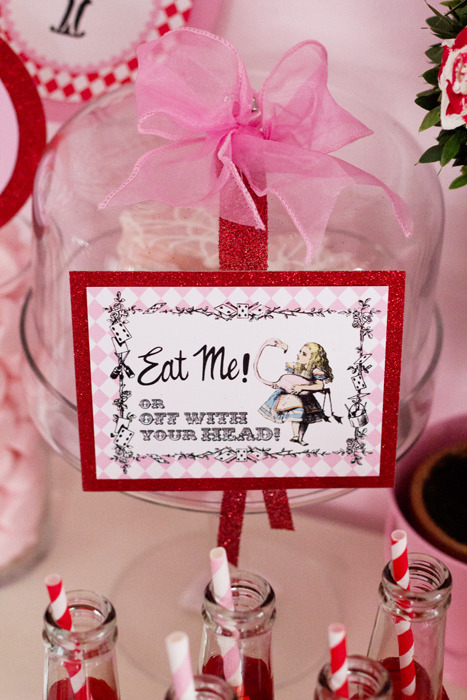 I also placed little Debbie valentine heart cakes in a bell jar with a cute label thats says the famous Alice in Wonderland line "Eat Me! 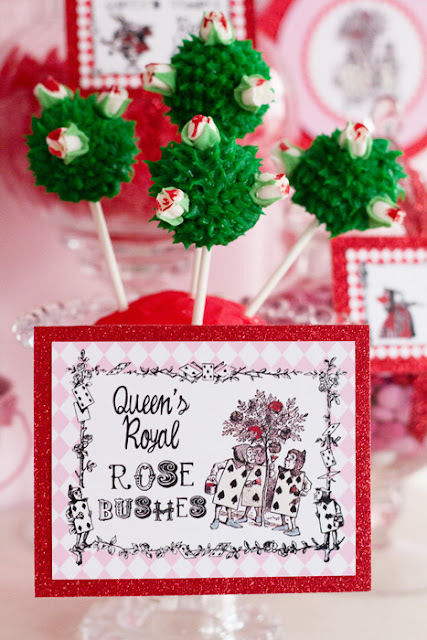 Or off with your head"
Frost the Cake Bakeshop on Etsy made me the cutest custom "Queen's Royal Rose Bushes" cake pops. The flavor is their famous "Royal Red Velvet" (so fitting to the theme I couldn't resist) covered in green piped vanilla icing and topped with sugar flowers, off course in white with red dyed edges! I am in love with these!!! 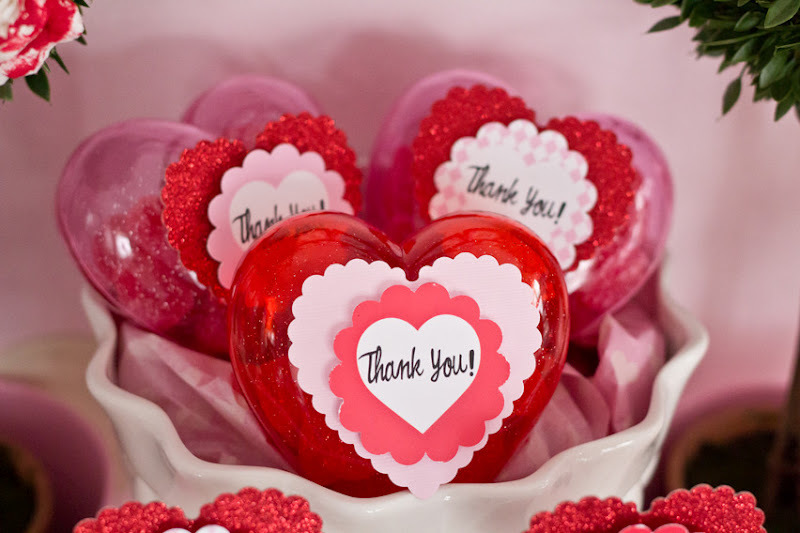 Clear plastic sparkle heart containers were purchased at Target in the dollar section, and filled with sugared heart gummies, as cute little favor packages for each guest to take home. Mini glass bottles were filled with red fruit punch and adorned with a mini "Drink Me" scalloped circle! 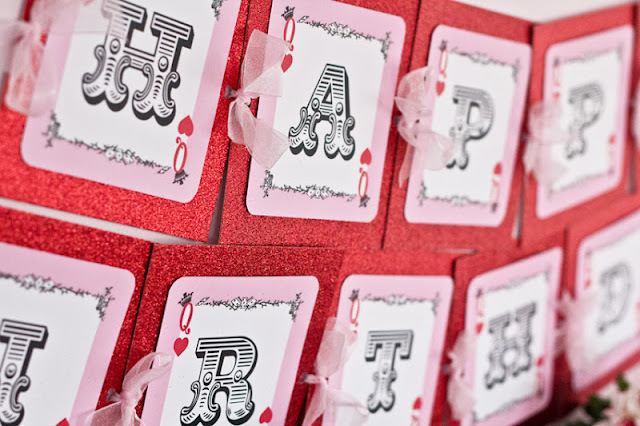 The invitation and birthday banner are shaped as Queen of Hearts playing cards. While the stop watch on the invite displays the date and time of the party, the white rabbit suggests "Don't be late!" and guests are told to R.S.V.P. or they'll have to face the red tempered queen! 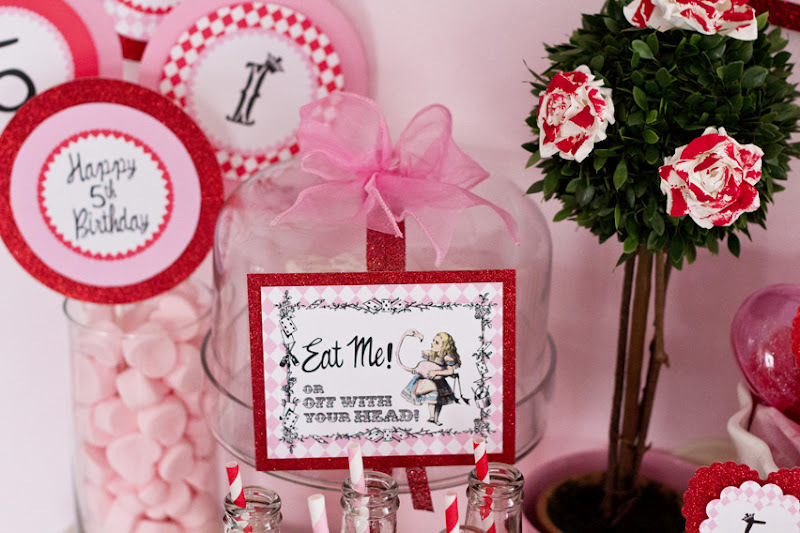 This party theme was so fun to create and design! I fell in love with all the fun details and little touches that make this collection so unique." 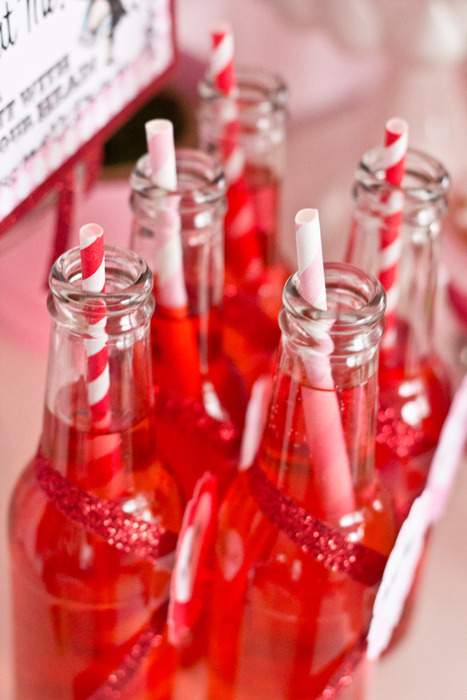 I love alice them *_* this looks perfect for a girly party. It couldn't have turned out any more beautiful!! Thank you for featuring our custom cake pops!